I love this quote! 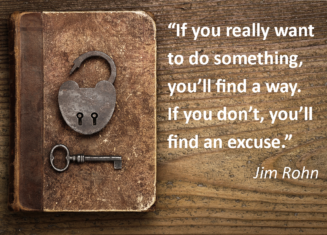 I admit I can sometimes fall victim to the excuse-making in defense of my own inaction or procrastination or fear. The bottom line is this: people who really, really want something DO find a way to make it happen. Before we start making excuses, let’s explore the truth in it. This quote does not say it happens overnight, or by magic. It says you’ll find a way. Finding a way looks different for us all. Sometimes we get hung up on the timing and we give up because it is going to take too long. That is an excuse. Time passes at the same rate regardless of what we’re doing. Sometimes we think it costs too much. That is also an excuse. It costs what it costs. The question is really “is it worth what it takes?” Why is it important? How badly do you want it? It is true that business owners have a lot to do, and no more time than anyone else in which to accomplish it. I often see firsthand how marketing gets pushed to the bottom of the pile because something else is more important at that moment. Putting out daily fires takes precedence over everything else and another week, month, or year goes by without telling people who you are, what you do, and why you do it. Missing this storytelling opportunity continually puts your business at peril and keeps you from getting what you want. Do you want your business to grow, to make more revenue, to be more profitable? This requires generating more leads, more business, and more visibility. The only way that’s going to happen is if you really want it. Finding a way to make it happen requires an investment of time, money, and effort. If you have more time, money, and effort to give it may happen quicker, but even spending SOME time, money, and effort will get you there. If you really want it, that is. Who’s ready to find a way to work on their marketing this year with no excuses? Good-now get started!